Verse 1 – Dead flies left in the holy oil will make the anointing stink; just like a few moments in the flesh can ruin a good reputation. Verse 2 – A wise man’s heart in the right place. He uses his wisdom for the good of others. A fool’s heart is in the wrong place. He does people wrong and tries to hide it. Verse 3 – A fool goes about thinking that he has fooled everyone. He is the one who is fooled. Verse 4 – If you are harshly confronted by a superior do not quit nor resign; calmly do what you are asked and stay employed. Verse 5 – There are mistakes we continue to make when deciding who will lead us. Verse 6 –We make leaders out of people who are not truly committed and people with real potential are ignored. Verse 7 – People out of place with their purpose and their position is not a pretty picture. Verse 8 – If you start trouble you will have trouble. If you set someone up to fail it will cause your failure. Verse 9 – When you carrying stones a stone can fall on you and hurt you. If you are cutting something down it might fall on you. Verse 10 – If you are not too sharp you have to work hard. 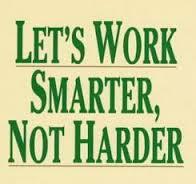 Learn more and then you can work smarter, not harder. Verse 11– A snake is a snake. A snake can’t help but be a snake. A snake will bite you without any reason. A gossiper is just like a snake. Verse 12 – What a wise person says will open up opportunity. What a foolish person says will only hurt their chances. Verse 13 – A foolish person begins the conversation bragging about themselves and ends the conversation belittling other people. Verse 14 – A foolish person talks like they know it all. We can only know what God wants us to know. Verse 15 – Knowing where you want to go without the directions to get there will make you exhausted and frustrated. Verse 16 – You are in real trouble when you are being lead by immature people who think more about themselves than the people they lead. Verse 17 – You are blessed if you have leaders who are well-prepared and well-disciplined. Verse 18 – Laziness is dangerous. It will allow everything that was built for you and around you to fall in on you. Verse 19 – Enjoy yourself and have a good time, but when it’s time to make money you need to get serious. Verse 20 – Don’t backbite a leader or say mean things about an employer. Whatever you say in secret someone will repeat it. Reblogged this on Prayer Everywhere's Blog.